A few days after the 2016 presidential election, I did a weird, sobbing thing. I copied Walt Whitman’s “A Noiseless Patient Spider” onto a card and posted it in my office. “And you, O my Soul, where you stand,/ Surrounded, surrounded, in measureless oceans of space,” I wrote. 2017 began, and that space had become everything; I just sat alone in the middle of it, swaddling myself in anxiety. I blocked myself from reading social media because I was afraid to feel angry about my friends and family. Every day was another national crisis; my husband and I started redirecting our money and attention to newspapers, charities, and organizations that protect —we’ve deemed these civic tithes. But I felt scattered and incapable of sustaining a thought, let alone a life of critical reading, or engagement with my government. I wanted to slip into a dark crack and hide there, unnoticed. I didn’t want to read. I didn’t want to move. To borrow from Whitman, my 2017 in reading was about the bridge I needed out of that dark space; the tentative, then hopeful casting of webs until something caught. Two books I read early in the year were bridges for different reasons. Courtney Maum’s novel Touch celebrates a future where the latest trends are freedom from technology, and physical human connection. That thought was a balm. The second was David McCullough’s collection of speeches, The American Spirit. Frankly, it gave me hope because it reminded me that America has been in dire straits before—awful messes—but is built on imperfection and persistence. I was reminded that books are products both of when they are written, and the world they are born into. I read Viet Thanh Nguyen’s phenomenal short story collection, The Refugees, the same week the president first cruelly called for a ban on all refugees entering the country. Many books I read—both fiction and nonfiction—in 2017 started to coalesce around the same idea: we don’t believe each other. Whether we’re talking about political needs, or allowing immigration, or honoring the story of someone who has been abused, belief is the central tenet of the conversation. Nguyen’s stories, like Roxane Gay’s memoir, Hunger, Hillary Clinton’s post-election memoir, What Happened, Mohsin Hamid’s magical novel Exit West, and Jesús Carrasco’s novel, Out in the Open, all deal in some way with the questioning of personal truth. This makes sense to me, given how we’ve treated truth like a toy for the last 10 years. I find that exhausting. I caught up on titles I’ve missed from years past, finally immersing myself in things like Phil Klay’s Redeployment, Chimamanda Ngozi Adichie’s Americanah, Colson Whitehead’s Underground Railroad. I read George Saunders’s Lincoln in the Bardo like everyone else and, like everyone else, was amazed. Two books from 2017 that stood out were Attica Locke’s smart thriller Bluebird, Bluebird, which moves beyond easy tropes of good guy/bad guy to tackle real issues of race in East Texas, and Andrea Lawlor’s gutsy, hopeful, gender- and shapeshifting novel, Paul Takes the Form of a Mortal Girl. I read wonderful books by people I adore: Liska Jacobs’s novel, Catalina, Tod Goldberg’s sequel to Gangsterland, Gangster Nation, JoAnn Chaney’s thriller, What You Don’t Know, Natashia Deón’s novel, Grace, Deanne Stillman’s historical nonfiction Blood Brothers, and Elizabeth Crane’s short story collection Turf. I read a funny memoir about a brain tumor: Mike Scalise’s The Brand New Catastrophe. I read Joan Acocella’s Twenty-Eight Artists and Two Saints and wondered if I’ll ever be the kind of critic I want to be. But all of these books were daring, moving, life affirming. And when I couldn’t handle the all-conflict-no-resolution scroll of social media, these words brought me back to myself and back to a sense of my place in the world. If there’s a slow words movement, like slow food, I want to join it. Most importantly: This summer I attended a teacher institute at the Library of Congress, and worked on a research project about the WPA Federal Writers’ Project—a time when our government prioritized putting writers to work by having them collect personal histories and write regional guides—writers like Ralph Ellison, Richard Wright, and Zora Neale Hurston. I knew that the Library has a vast array of online and physical resources, but what I didn’t know is that it relies on an almost parallel network of human historians. As I navigated my way through the various reading rooms, I was guided by experts in American Folklife who showed me slides of Hurston in Florida and played recordings of her singing; I was handed boxes of photographs of Federal Writers’ Project Book Fairs by WPA experts in the Prints and Photographs room, and in Manuscripts, an excited WPA expert pulled four boxes of FWP minutes, hand-written notes, and records for me to read. I kept wondering why they were letting me look at all of that stuff. (What if I sneezed on something?) But all I needed was my library card. My most powerful moment in reading was sitting in those quiet, beige rooms in D.C. with American history in my hands. Libraries are still a beautiful democracy of ideas. Despite the sky falling every day in 2017, we have that. It was the thread of connection I needed. O my soul. During the first half of the year, I read poetry. While I stayed at Rachel McLeod Kaminer’s downtown loft, I picked up Patti Smith’s Early Work: 1970-1979 and Louise Mathias’s The Traps from her bookshelf, and later in the year, read Kaminer’s collection As in the Dark, Descend. In San Francisco, McSweeney’s editor Andi Winnette handed me Rebecca Lindenberg’s Love, an Index. Lindenberg’s partner went on a trip to research volcanoes in Japan and then disappeared. He never returned. She lost him and she wrote these poems. While in Connecticut, I read Gary Young’s Adversary and when I was back in California, I read Young’s Even So. I read Love Sonnets and Elegies by Louise Labé and I didn’t think I’d particularly enjoy love sonnets by a woman from the 16th century but I did. I liked reading her yearning. It made that kind of ache seem timeless. I spent hours late at night reading the manga Lone Wolf and Cub, a tale of violent revenge set in Japan’s Edo period. The lead character is a former shogun’s executioner who lives a life as an assassin and cares for his toddler-aged son. Father and son, together they travel the country, carrying out murders. As this 28-volume tale unfolds, the plot thickens and more becomes at stake, but I only read up to volume 13 because I became distracted by life. There is a strong likelihood that I will spend the second half of December fiendishly finishing this blood-filled story. Not only are the illustrations of the landscape beautiful and many of the lines read like poetry, but I’m slightly in love with this story. I read What Becomes Us by my former professor Micah Perks. The language in this story is lively and reads fast, and the story centers on Evie who is pregnant with twins and leaves her abusive husband on the West Coast to start a new life on the East Coast. The town she moves to is community-oriented but also strange and a bit creepy. As Evie’s hunger for love, food, and more takes her over, she begins to have visions of historical figure Mary Rowlandson. During King Philip’s War, Mary Rowlandson was held captive and wrote a narrative about her experience; this captivity narrative was the first prose book published by a woman in the Americas. After I finished What Becomes Us, I read The Narrative of the Captivity and Restoration of Mrs. Mary Rowlandson. I read Natashia Deón’s critically acclaimed debut novel Grace, which is an epic novel that masterfully and keenly tells the story of Naomi and her daughter, Josey, as well as the stories of the men and women they encounter. All of Deón’s characters are alive and complex and her language is filled with rich images that delight, surprise, and many times hurt. Grace brings the history of slavery in the United States very close to the reader and in doing so, offers the reader space to imagine the dreams and visions of the people who lived this history, dreams and visions that people in power suppressed and tried to erase from our history and imagination. In April, Viet Thanh Nguyen’s Nothing Ever Dies was published by Harvard University Press and the book was shortlisted for the National Book Award for nonfiction. Nguyen wrote a critical text that examines war and memory and forgetting, and this academic book is accessible to nonacademic readers. For years, I told myself I wasn’t smart enough to comprehend theoretical and academic texts, but after reading and line-editing Nugyen’s book, I realized that not only are some academic works accessible and comprehendible, but their analysis of relevant topics are crucial in helping me understand the world in which I live. I suppose I believe that if I fully understand power structures, then I can strategically fight against them. I read Claudia Rankine’s Citizen: An American Lyric and after I finished the book, I read interviews with her from 2014 and listened to recordings of her reading excerpts of Citizen. In September, she became a MacArthur Fellow and that same month in a Buzzfeed interview said, “As citizens, we’re being asked to be in collusion with the murder of black people, to not regard it as a state of emergency, and to continue in our normal course of business.” This year, she encouraged us as American citizens to acknowledge that we are in state of emergency. In October, I read headlines that she was using the MacArthur grant to study whiteness and that she stated, “It’s important that people begin to understand that whiteness is not inevitable, and that white dominance is not inevitable.” In 2017, I want to read books that help further the idea that both whiteness and white dominance are not inevitable, and I want to read books that help me understand how exactly we got to the place that we are in now. We typically schedule the essays and reviews and lists we run at The Millions a week or two in advance. Before the U.S. election, I looked at what we had in the hopper and tried to arrange the posts for timeliness. This was basically a symbolic gesture since The Millions is a total literary miscellany, and mostly contributor-driven — we don’t have the budget to commission much work (see publisher Max Magee’s call for support here). Max and I conferred about what to run on election day itself; we agreed that a lovely, calm installment of Hannah Gersen’s Proust Diary was the thing. I asked him what we should run if Donald Trump won. “SHUT IT ALL DOWN,” he wrote, sort of joking. 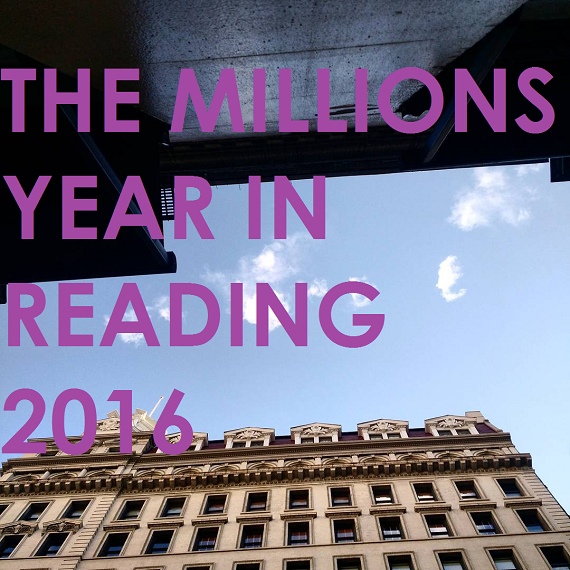 But then the Year in Reading entries started coming in, from more than 70 writers. This is the 13th year of the series, and it feels like the most necessary yet. The entries have a measure of fear and grief, yes. They are about reckoning with the past, and preparing for the future. They are also full of beauty, full of sensitivity, full of intelligence, full of curiosity and care. They are about dissolving in someone else’s consciousness. About sharing suffering. About taking a break. About falling in love. Based on the entries this year, I can confirm that readers are still very into Elena Ferrante. But there are many other names to discover in this series — exciting debuts and forgotten classics and authors whose names were on the tip of your tongue. There are hundreds of books: novels, essays, works of nonfiction, and poems. As in prior years, the names of our 2016 contributors will be unveiled throughout the month as entries are published (starting with our traditional opener from Languagehat’s Stephen Dodson). Bookmark this post, load up the main page, subscribe to our RSS feed, or follow us on Facebook or Twitter to make sure you don’t miss an entry — we’ll run three or four per day. And if you look forward to the Year in Reading every year, please consider supporting the site and ensuring this December tradition continues for years to come. There are difficult weeks and years ahead, but we hope you’ll be momentarily refreshed and heartened as you hear from an array of prodigious readers and writers. At the very least, you’ll find something good to read. Chigozie Obioma, contributing editor at The Millions and author of The Fishermen. Sofia Samatar, author of A Stranger in Olondria and The Winged Histories. Claire-Louise Bennett, author of Pond. Tony Tulathimutte, author of Private Citizens. Caille Millner, author of The Golden Road: Notes on My Gentrification. Edan Lepucki, contributing editor at The Millions and author of California. Matt Seidel, staff writer at The Millions. Sonya Chung, contributing editor at The Millions and author of The Loved Ones. Nick Moran, special projects editor at The Millions. Jacob Lambert, staff writer at The Millions. Michael Bourne, staff writer at The Millions. Tess Malone, associate editor at The Millions. Tana French, author of The Trespasser. Hanif Willis-Abdurraqib, author of The Crown Ain’t Worth Much. Esmé Weijun Wang, author of The Border of Paradise. Nicole Dennis-Benn, author of Here Comes the Sun. Richard Russo, author of Empire Falls. Annie Proulx, author of Barkskins. Teddy Wayne, author of Loner. Brandon Shimoda, author of Evening Oracle. Basma Abdel Aziz, author of The Queue. Imbolo Mbue, author of Behold the Dreamers. Yuri Herrera, author of Signs Preceding the End of the World. Sally Rooney, author of Conversations with Friends. Bich Minh Nguyen, author of Pioneer Girl. Jacqueline Woodson, author of Brown Girl Dreaming. Megan Abbott, author of You Will Know Me. Mauro Javier Cardenas, author of The Revolutionaries Try Again. Emily St. John Mandel, staff writer at The Millions and author of Station Eleven. Zoë Ruiz, staff writer at The Millions. Nick Ripatrazone, staff writer at The Millions. Kaulie Lewis, staff writer at The Millions. Hannah Gersen, staff writer at The Millions and author of Home Field. Il’ja Rákoš, staff writer at The Millions. Claire Cameron, staff writer at The Millions and author of The Last Neanderthal. Anne K. Yoder, staff writer at The Millions. Kiese Laymon, author of Long Division. Cynthia D’Aprix Sweeney, author of The Nest. Ed Yong, author of I Contain Multitudes. Natashia Deón, author of Grace. Bridgett M. Davis, author of Into the Go-Slow. Anthony Marra, author of A Constellation of Vital Phenomena. Leila Aboulela, author of The Kindness of Enemies. Brit Bennett, author of The Mothers. Dimitry Elias Leger, author of God Loves Haiti. Chloe Caldwell, author of I’ll Tell You in Person. Natalie Baszile, author of Queen Sugar. Danielle Dutton, author of Margaret the First. Dan Chaon, author of Ill Will. Lisa Lucas, Executive Director of the National Book Foundation. Madeleine Thien, author of Do Not Say We Have Nothing. Anuradha Roy, author of Sleeping on Jupiter. Marie Myung-Ok Lee, staff writer for The Millions and author of Somebody’s Daughter. Janet Potter, staff writer at The Millions. Ismail Muhammad, staff writer at The Millions. Lydia Kiesling, editor of The Millions. Elizabeth Minkel, staff writer at The Millions. Adam Boretz, web editor of The Millions. Garth Risk Hallberg, contributing editor at The Millions, author of City on Fire. Mark O’Connell, staff writer at The Millions, author of To Be a Machine. Kevin Nguyen, digital deputy editor for GQ. Nadja Spiegelman, author of I’m Supposed to Protect You from All This. Chris Bachelder, author of The Throwback Special. Álvaro Enrigue, author of Sudden Death. Aimee Nezhukumatathil, author of Lucky Fish. Sylvia Whitman, owner of Shakespeare and Company bookstore. Mensah Demary, editor for Catapult. Jade Chang, author of The Wangs vs. the World. Manuel Gonzales, author of The Regional Office is Under Attack!. Lilliam Rivera, author of The Education of Margot Sanchez. Jane Hu, writer; grad student; Canadian. Chris McCormick, author of Desert Boys. Michelle Dean, author of Sharp: The Women Who Made An Art of Having an Opinion.